LED bulbs are fast replacing halogen lamps, high pressure sodium lamps and even CFL lights as the preferred choice of lighting in homes and commercial spaces. LED bulbs are far more efficient and environment friendly than these traditional sources of light. 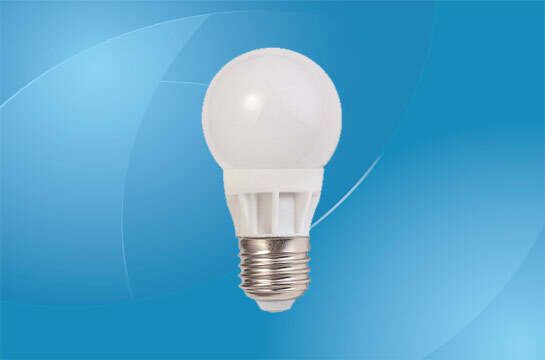 3 Watt LED bulbs in particular are becoming more popular for use in display windows in stores, in hotels, homes and exhibition halls, and any decorative lighting setups. Not only are LED bulbs more energy efficient than halogen and CFL lights, but they are also longer lasting and far less likely to break. They also produce more light in comparison to incandescent bulbs with equivalent wattage. These lights also turn on instantly and their longevities are unaffected by cycling on and off. LED stands for Light Emitting Diode. A light emitting diode is simply a small semiconductor encased in plastic to focus the light. It does not require a filament to produce light from heat, unlike a halogen bulb. Instead, LED bulbs use electricity to stimulate photons on the semiconductor surface for illumination. Usual semiconductor materials used are gallium, phosphorus and arsenic. LED bulbs in general are brighter than incandescent lamps and CFLs of the same wattage. 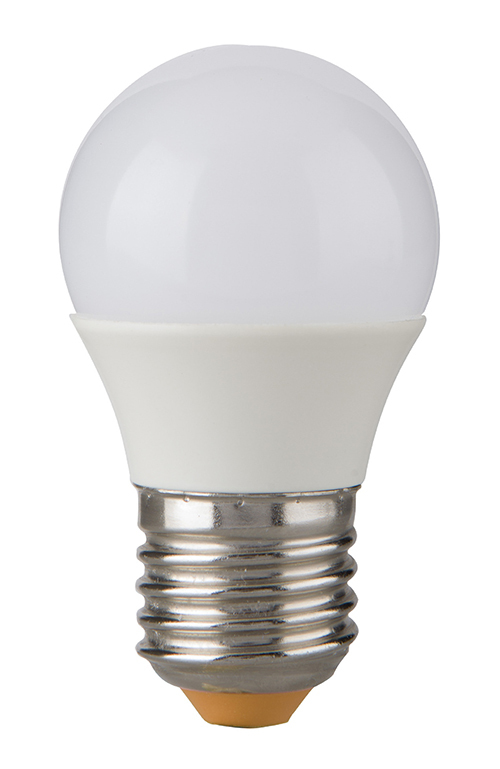 A 3-watt LED bulb may produce anywhere between 240 to 320 lumens of illumination. Lumens is a measure of light. ‘Lumens per watt’ is the measure to identify how much light is produced for the energy or wattage drawn. Accordingly, the minimum efficiency of a 3 Watt LED bulb will be 80 lumens/watt. A 20 Watt halogen bulb on the other hand may produce 350 lumens of energy on average, with an efficiency of 17 lumens per watt used. 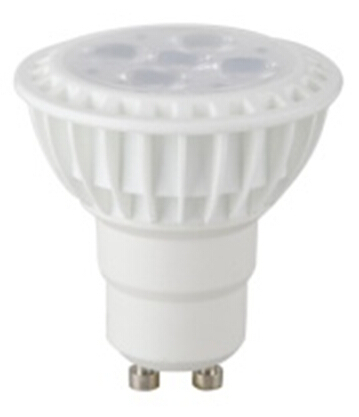 3 Watt rated LED bulbs consume very low power, usually less than 4 watts. 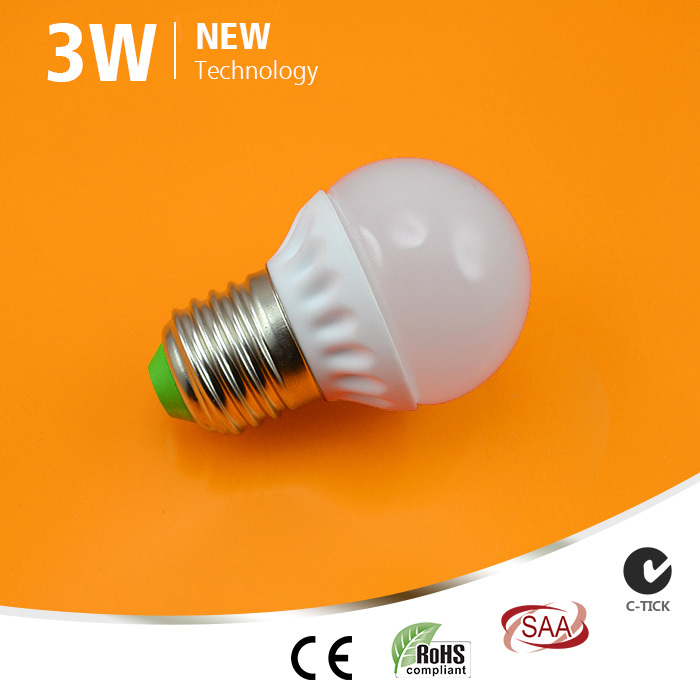 A single 3 Watt LED bulb can be equivalent to a 30 Watt fluorescent lamp. It is possible to choose between white light LED bulbs, warm light LED bulbs and colored light. White light bulbs can last more than 50,000 hours. On the other hand colored LEDs can last twice as long at more than 100,000 hours. No mercury is used in the manufacture of LED bulbs, unlike CFLs and incandescent halogen bulbs. As a result, disposal of the bulbs at the end of lifecycles does not pose a hazard to the environment. 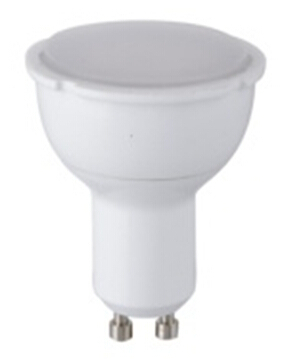 3 Watt LED bulbs are popularly used as accent lighting or down lighting in offices, homes and shops. They are also suitable to be used as reading lamps, bicycle lamps etc. 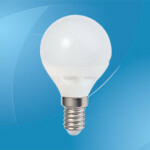 Commercially available A-line 3 Watt LED bulbs come in 4 general styles. 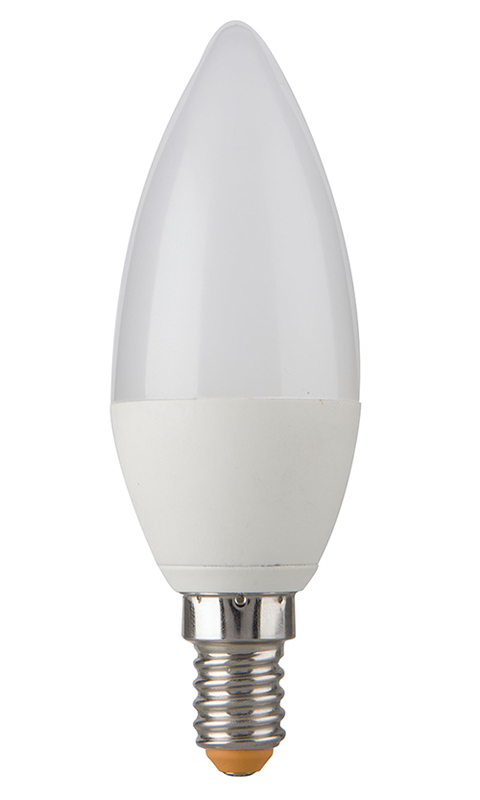 The traditional rounded A-line bulbs disperse the light at wider angles, making these ideal as reading lamps, for room area lighting and use in hallways. Candle bulbs are ideal as decorative lighting, especially in wall sconces. Spotlights focus the light to a small area, making them ideal for use as track lights and recessed lighting overhead. Floods have a wider angle of light dispersal than spotlights. They can be used for recessed lighting, landscape lighting, outdoor floodlights and motion sensors. These bulbs may be available with pin base or screw in configurations. Power: 3W; Input voltage: AC 220-240V; Light source: Epistar 2835 LED; Luminous flux: 220-240lm; Beam angle: 120°; Color temperature：Warm/Natural/Cool White; Power factor: 0.4 min. ; CRI: 80 Ra min. ; Material: Plastic + Aluminum; Life: 30000 hours; Warranty: 2 years. Power: 3W; Input voltage: AC 220-240V; Light source: Epistar 2835 LED; Luminous flux: 200-230lm; Beam angle: 24/36°; Color temperature：Warm/Natural/Cool White; Power factor: 0.4 min. ; CRI: 80 Ra min. ; Material: Thermal conductive plastic; Life: 30000 hours; Warranty: 2 years. Power: 3W; Input voltage: AC 220-240V; Light source: Epistar 2835 LED; Luminous flux: 220-240lm; Beam angle: 230°; Color temperature：Warm/Natural/Cool White; Power factor: 0.4 min. ; CRI: 80 Ra min. ; Material: Plastic + Aluminum; Dimension: Φ37*H108mm; Life: 30000 hours; Warranty: 2 years. 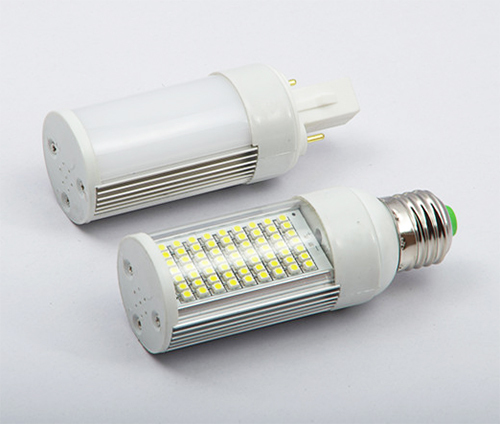 Power: 3W (9W CFL replacement); Input voltage: AC 85-265V; Frequency range: 50Hz-60Hz; Power factor: >0.9; Driver: Constant current; Light source: SMD 3528, 63 pcs; Light output (Lumens): 270-300lm; CRI (Ra>): 80; Beam angle: 120°; Color temperature: Warm white (2900-3200K), natural white (4000-4500), cold white (6000-6500K); Material: Aluminum; Milky cover or clear cover; Base: G24\E27\E26\B22; Size: Φ40mm*110mm; Warranty: 2 years.